EDITOR'S NOTE: Images by Alistair McCallum have been exhibited at Vermont Artisan Designs for many years, but this month the public has a chance to meet the man behind the camera during a Gallery Walk reception, and chat with him about his work. Alistair McCallum has been working with photography for over 30 years. He received his formal training at the Rochester Institute of Technology, from which he graduated in 1979. For the past 25 years he has made his home in Mt. 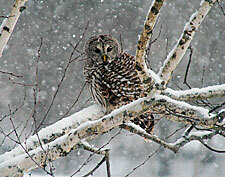 Holly, Vermont, and has concentrated his photography on the streams, farms, and forests of this beautiful state. He works in black and white using both medium-format film and digital cameras. 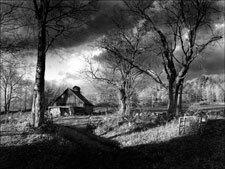 McCallum prints his own work, spending many hours perfecting each image. The photographs are printed using all archival processes and materials for image permanence, and they are mounted and matted using acid-free materials. The prints are signed and numbered in limited editions. McCallum has exhibited his work throughout the country, and his works are in many private and corporate collections. He has been featured in regional and national publications such as Shutterbug Magazine, artscope, and the Vermont Sunday Magazine. McCallum roams the back roads and countryside seeking natureís unique moments of light, season, and weather. He hopes that his images can capture for viewers some of the beauty, drama, and serenity that he felt while photographing them.